The 2013 SAP Pinnacle award in the category "Quality Award Partner of the Year" went to Big 4 accounting firm Deloitte. The award was given in recognition of the firm's strong partnership with SAP. SAP's Pinnacle awards are presented annually to the top partners that have excelled in developing and growing their collaboration with SAP and driving customer success. Finalists and winners in 19 categories were based on field recommendations, customer feedback, and performance indicators in the following four categories: co-innovation, market expansion, service delivery, and sustainability. "We're thrilled to be recognized as the SAP partner providing virtually unparalleled quality for our clients," said Jerry Hoberman, deputy global SAP practice leader and director, Deloitte Consulting LLP. "This award underscores our commitment to delivering implementations of solutions that generate business value for our clients." The SAP Pinnacle awards showcase SAP's commitment to its partner ecosystem strategy, which delivers unmatched value to customers and enables SAP to reach its business goals. Award winners will be formally recognized at SAPPHIRE® NOW, SAP's international customer conference held in Orlando, Fla., May 14–16, 2013. "We congratulate Deloitte on its well-deserved receipt of the 2013 SAP Pinnacle Quality Award and for its outstanding partnership with SAP," said Eric Duffaut, corporate officer and president, Global Ecosystem and Channels, SAP. "SAP is an innovative and fast-growth company. We put customer success at the center of everything we do. Our vibrant and expanding ecosystem of partners is critical to the company we are now and the company we want to become in the future. Together with our partners—who are co-innovating with us, reselling, and implementing our solutions—we offer choice and deliver transformational value to our joint customers of all sizes. Partners like Deloitte are our force multipliers, and today, more than ever, they are essential to our customers' success." As a recipient of a 2013 SAP Pinnacle award, Deloitte has been invited to participate in the SAP Leadership Forum at SAPPHIRE NOW. The SAP Leadership Forum will bring together an exclusive group of executives from SAP's top customers, prospects, and partner organizations, providing an opportunity to network and exchange business ideas. Enterprise software giant SAP has been throwing its hands in the air for years, exclaiming that it is indeed a cloud company. But yesterday, SAP took a big step that shows where the it and its customers are at by offering its "HANA" in-memory database technology from its own cloud. HANA (High-Performance Analytic Appliance) is an appliance that stores terabytes worth of data and can move through that data at high speeds. As of this week, SAP and its clients are storing more than 750TBs of data in the system. HANA is an expensive solution not many companies can offer, and it's clearly important to SAP's future. "We expect [HANA] to have a billion-dollar future on its own," SAP mobility head Sanjay Poonen told us in November. SAP previously only offered HANA via the cloud through Amazon Web Services. There are many potential reasons why SAP would want to offer HANA from its own cloud rather than AWS. For example, it gives SAP more control over its product, lets SAP allocate the right high-performance hardware for HANA's monumental tasks, and lets SAP offer HANA in the cloud at a lower overall cost. But after talking with several "big data" experts, one final reason particularity sticks out: SAP needed to move HANA to its own cloud to make it easier to deploy the damn thing to businesses. "In the last 10 years, the speed of business has significantly increased," Stefan Groschupf, the CEO of Hadoop-based big data analytics startup Datameer, told VentureBeat. "No one has time to wait 18 months anymore." Essentially, many businesses have given up on overly long deployment cycles — it bogs down other processes, and the software is outdated once it's ready to be deployed. Cloud software pioneers like Workday have shown enterprises how handy the cloud can be and they like what they've seen. SAP and chief competitor Oracle have been watching this trend carefully during the past few years. Both companies have acquired smaller companies and launched new cloud-focused products to help speed up deployments and stay relevant. SAP's biggest move in recent history was acquiring SuccessFactors for $3.4 billion back in December 2011. Similarly, Oracle has purchased a boatload of companies. That said, lean startups focused on big data solutions could gobble up some of the market SAP wants to attack with HANA. One such startup is SiSense, a big data company that has seen a 520 percent growth in subscription revenues in the past year. SiSense's offering is different than HANA but it still thinks it can solve many businesses' big data qualms. "We can run on any hardware out there; many companies don't want to buy new hardware," SiSense marketing VP Bruno Aziza told VentureBeat. "There's been a shift in the market for how people procure their big data solutions." For example, SiSense's CTO recently crunched 10TBs of data in 10 seconds using an off-the-shelf $10,000 server as a conference stunt. Another thing on SiSense's side: it only takes "hours" to deploy. Big Data and Predictive/Real-time Analytics startups: Are you looking to jumpstart development & accelerate market traction? Sign up for the SAP Startup Focus program to receive technology, support, resources and community to help you develop new applications on SAP HANA, a cutting edge database platform. Get started here, and enter promo code "VB2013″ on the form. SAP, a market leader in enterprise application software, has launched the SAP Hana Enterprise Cloud service designed to offer a new deployment option to gain value from the innovation of SAP Hana, the in-memory platform. Going forward, running mission-critical SAP ERP, SAP CRM, SAP NetWeaver Business Warehouse and new and unprecedented applications powered by SAP Hana will be possible as a managed cloud service with elastic petabyte scale. SAP aims to enable organizations to realize faster time-to-value coupled with lower total cost of ownership, and enjoy flexibility and reliability from the world's leading enterprise application software provider. "With SAP Hana Enterprise Cloud, we are addressing a fundamental customer need that we have seen since we first launched Hana," said Dr Vishal Sikka, member of the Executive Board of SAP, Technology and Innovation. "Customers want more and more options in how they take advantage of the value SAP Hana brings. With the SAP Hana Enterprise Cloud, we are delivering Hana at scale with instant value and no compromise. We are simplifying customers' experience and expanding their choice in how they want to adopt SAP Hana, now bringing it to a massive scale for enterprise mission critical applications – and we are doing this without disruption through the cloud." SAP plans to deliver the SAP Hana Enterprise Cloud along with its partners in an "open + us" strategy, he added. SAP intends to adapt this open ecosystem strategy with its managed service providers to offer the capabilities of SAP Hana Enterprise Cloud from their data centers, as well as from multiple SAP data centers worldwide. "SAP and Intel have a long history of joint innovation and a shared vision of delivering the powerful in-memory platform SAP Hana to all server customers, including those utilizing the cloud," said Diane Bryant, senior vice-president and general manager, Data Centers and Connected Systems Group, Intel. While many business-software makers are seeing sluggish growth, Germany's SAP AG bucked the industry trend in the first quarter by posting a double-digit profit gain. For SAP, the world's third-largest software maker by sales, success in the Asian-Pacific region is vital. At first glance, the region's contribution—15% of the company's overall revenue in the first quarter—pales in comparison with the U.S. and Europe. But Stephen Watts, an Irish-born executive who took the helm of SAP's Asian-Pacific operation in 2010, says that his region is playing an increasingly important role in the company. SAP's software business in Asia has doubled over the past three years, and that growth isn't likely to slow: In China alone, the company plans to invest $2 billion by 2015. SAP counts Oracle Corp. among its main rivals, while its newer cloud-based business competes with Salesforce.com . In the first quarter, SAP's net profit rose 17% from a year earlier to €520 million ($680 million), while Oracle's net profit for its December-to-February fiscal quarter was flat compared with a year earlier as revenue declined slightly. WSJ: What kind of support are you getting in Asia from the German headquarters? Mr. Watts: I report to SAP's board, and we have a very flat organizational hierarchy. The company is very serious about Asia, and investments and support I receive are incredible. When your business has doubled in three years, you probably have the right to ask for a little bit more, too. Board members are very interested in meeting our customers in Asia. I think that's one of the things that differentiates us in what we do; I don't have somebody in the U.S. telling me "We think we know what's best for Asia." WSJ: How is SAP's business in the Asian-Pacific region? Mr. Watts: For the past three years Asia-Pacific has been the fastest-growing region for SAP, and the business is expected to stay solid as we invest more. Our software business in the region doubled in the last three years. The region now has around 23,000 customers and about 8,000 employees. We are investing not only in major markets like China and India, but in other emerging markets like Indonesia, Vietnam, Sri Lanka and Bangladesh. In this region we have more potential in our existing customers, and more potential new customers, than anywhere else in the world. I wish everyone else well in the rest of the world, but I don't understand why you would want to live anywhere else. 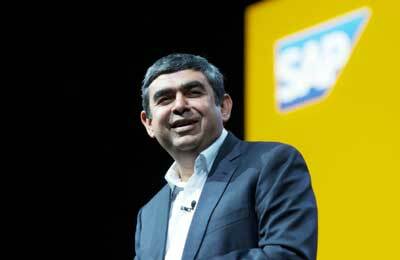 WSJ: What is the biggest challenge for SAP in Asia? Mr. Watts: Building and scaling talent. Asian emerging markets are talent-rich but experience-poor. The kids coming out of school are incredible, but the availability of mentors and coaches around them isn't as great as some other more mature markets. In mature markets I might find 10 people in middle-management positions who have experience in some of our core operations. In markets like China, Sri Lanka and Bangladesh, I might find one. Across Asia, we take a ground-up approach and spend a lot of time educating young people. In China, for example, we work with over 70 universities on curriculums that help build fundamental business and technology skills. That's the single-best enabler of growth for all of us. WSJ: Do you feel competition intensifying in Asia? Mr. Watts: Our major global competitors like Oracle are all here in Asia. But I'd say our biggest competitor in Asia today is a mix of alternate uses of capital. Instead of spending money on software, customers can spend it on a new shop or factory, or to hire more people. In Asia, people running fast-growing businesses are not interested in technology for the sake of technology. Ten or 15 years ago, software makers sold products based on new functions and features, by showing customers how well it worked on the screen. That's not the situation we have today. You have to show how the software will help improve, for example, shipping and transportation management, and what kind of impact that will have on the customer's business. The software's functions and features are an absolute given, and that's not a differentiator any more. The differentiator is the business value you get out of the technology. WSJ: How is your business in China? Mr. Watts: We've been in China since the mid-1990s and we continue to invest in scale. Clearly the opportunity is vast, and it just takes time. We have over 2,000 developers based near Shanghai, and we are developing enormous amount of software there for the rest of the world and also for Chinese customers. We have also moved our global customer-support headquarters from Germany to Beijing. We invest in China for the long term. We announced over a year ago that we would be investing about $2 billion into China by 2015, and we are well under way. Many of our customers, locally and globally, are building scale in China, so we must be there as a partner. WSJ: How would you describe your management style? Mr. Watts: I've lived in Singapore for years, but I travel between 250 and 300 days a year. I spend a lot of time listening to customers all over Asia, because I believe that's the best way to actually understand business. You visit your customers regularly and frequently, and over time you build trust. I'm now in a position to be able to say, when someone says I think we should go left, I can have the voice of the customer in my ear that says "Hmm…are you sure?" Even though we build software globally, we operate locally. That means I have to operate locally too. Career: Became the head of SAP's Asia-Pacific and Japan operations, covering more than 20 countries, in January 2010. Before the current position, Mr. Watts was most recently chief operating officer for the region. He joined the company in 2001 as sales director for SAP Australia and New Zealand.